The Corinthian Classic Yacht Regatta had over 60 yachts participate last year and that number will be trumped in 2012. Our message is simple: Free mooring space will be limited and will be at a premium the longer you wait to register. This year's Honoree and Featured Speaker will be Halsey Herreshoff. The fete' honoring Ted Hood was a sell-out last year, so again, enter now and make your dinner reservations to be a part of this very special evening. The Corinthian Classic Yacht Regatta (CCYR) - presented by Officine Panerai (www.panerai.com) - celebrates Classic Sailing Yachts. 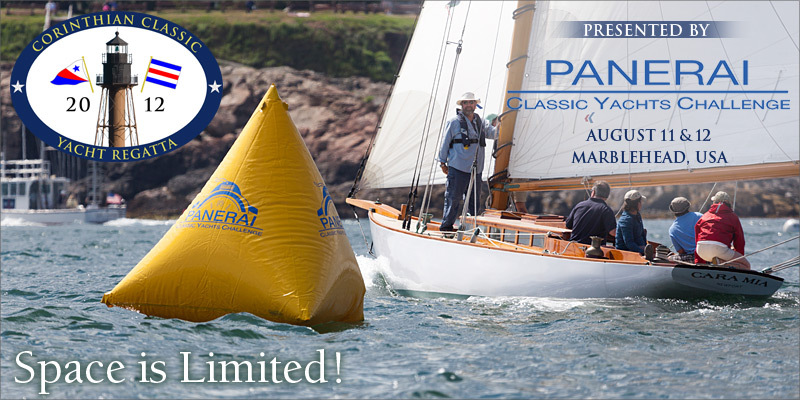 The regatta is for classic sailing yachts of 3 types: Classic Wooden, Classic GRP/Plastic and Spirit of Tradition. Don't procrastinate. Go ahead... register for the Corinthian Classic and ensure a great spot in Marblehead Harbor.